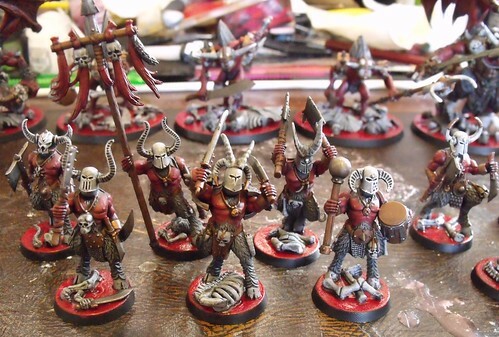 Lords of Blood: Lots of Red: 1st Painting Batch Done! Lots of Red: 1st Painting Batch Done! Djymikh the Debaser is a patron of Hans Kho'ren of the World Eaters. When Hans Kho'ren's Skull Takers were recruited by Angron for the attack on Armageddon, Ymmikh accompanied them, eager to shed blood in Khorne's name. The Bone Collectors. 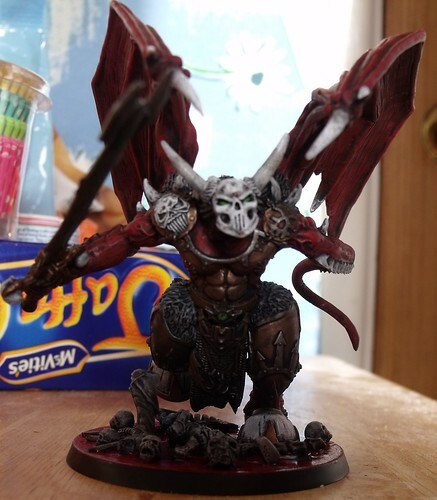 Once mortal champions of Khorne, they walk the fine line between Spawnhood and Daemon Princedom: vastly mutated beyond their mortal bodies, but only just maintaining control over their form and mind. 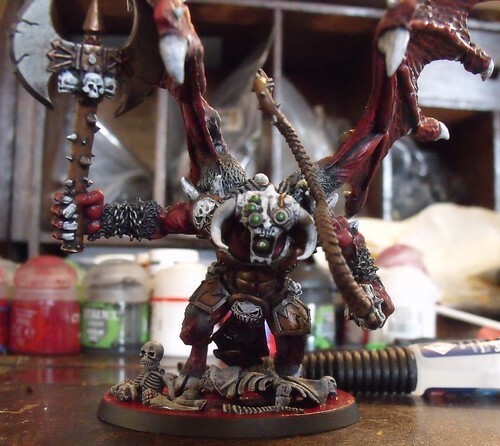 They spend their lives shedding blood and collecting kills for Khorne: to keep him smiling upon them; to persuade him to not smite them into Spawn; and possibly to convince him to bless them as Daemon Princes. This particular group of Bloodletters were all created from the blood shed in fights between Space Marines, between those who should be brothers. They first emerged in the Horus Heresy, as Angron purged his legion on Istvaan III, and have followed his career ever since - from Ultramar to Terra to the Eye of Terror. Now that Angron has descended from the Devourer of Stars to destroy Armageddon and its Space Wolf defenders, they pull themselves out of the Immaterium once more, formed from the blood of Astartes of both sides. Born long ago in a terrible crusade between two armies of heavily armoured knights, both believing that they fought for the One True God, these Bloodletters have always flocked to violence and sought to use mankind's violent urges to create rents in reality.